The VORs are the mainstay of aerial navigation, so it pays to be able to use them easily and proficiently. By using three different VORs for picking up checkpoints and using a fourth for tracking your course, this flight will help you develop such proficiency. In addition, you'll have a good opportunity to try completing a precision landing at the end. 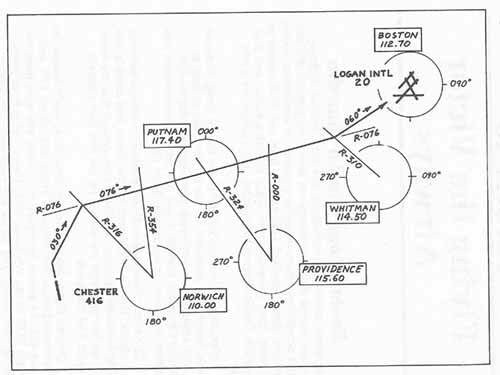 You'll depart to the north from the small airport at Chester, after which you'll pick up a VOR radial from Putnam and track it first inbound to the station, and then outbound toward Logan. Along the way you'll set NAV-2, in turn, to the Norwich, Providence, and Whitman VORs, picking up checkpoints en route. You'll have to be on your toes to stay on top of the periodic switching of frequencies and radials on NAV-2, but, other than that, the procedures really aren't new. The set-up parameters are given below; the path of flight is shown in Figure 3-2; and the flight plan follows. Departure. Take off on Runway 35. On the climb, turn right to heading 030°, which will give you a 46° interception angle with the Putnam 076° radial. Checkpoint 1. Interception of R-076. As the NAV-1 needle begins to center, note the time and enter it as the ATA at checkpoint 1. Turn right to heading 076°, and make any necessary adjustment to get the NAV-1 needle centered. Calculate your ETA for checkpoint 2 by adding the ETE of 8 minutes to the ATA you just entered for checkpoint 1. Reset the NAV-2 omni bearing to 354° for the next checkpoint. Toggle the NAV-2 omni bearing from time to time if you wish, to determine how close you are to the upcoming checkpoint. Checkpoint 2. Norwich R-354. When the NAV-2 needle centers again, enter the ATA, calculate and enter the ETA for checkpoint 3, and reset NAV-2 for Providence (115.60) R-324. Checkpoint 3. Station Passage at Putnam. Monitor the DME as the reading falls toward zero. The NAV-2 needle should also center as we pass the station, but for this checkpoint station, passage is the primary indication, while NAV-2 is just a secondary reference. Remember not to chase the needle once we're within a few miles of the station—have it centered and be on heading 076° before you're in close, and then just hold your heading as the needle begins moving to the side of the window. At DME 0, note the time, enter the ATA, then estimate and enter the ETA for checkpoint 4. Reset the NAV-2 omni bearing to 000, for the next checkpoint. Checkpoint 4. Providence R-000. As the NAV-2 needle centers, follow the usual procedures. Then reset NAV-2 to Whitman (114.50) R-310. Checkpoint 5. Whitman R-310. As the NAV-2 needle centers, write down the ATA. Then turn left to heading 060°, toward Logan. When on the new course, estimate and enter our ETA at Logan. Finally, reset NAV-1 to the Boston VOR, which is on the field at Logan International. Now the DME will give you the distance to the airport. You can toggle the omni bearing on NAV-1 to 060° (as a reminder of the inbound heading) if you wish, but it won't be necessary to actually track that bearing to the airport. Approach. At Logan, they're landing toward you. You're cleared for a visual approach to Runway 27, which means you'll fly a standard pattern, with a downwind heading of 090°, just this side of the runway. Be set up for the approach before you're 8 miles DME from the field, and at 8 miles begin your descent to traffic pattern altitude—say 900 feet. Head directly for the airport as we descend, then turn right to 090° onto the downwind leg. Stay very close in, and you can try a precision power-off landing to wrap things up. Not for use in navigation.